Work continues to find the ideal weight loss surgery. The Mini-Gastroplasty (MG) was designed to provide a simple, safe and effective restrictive type of Gastroplasty, with anatomy similar to the sleeve gastrectomy, has been used for 9 years. Methods: The MG consists of a complete division of the lesser curve from the body of the stomach to the antrum (Collis gastroplasty.) The gastric tube is then reattached to the distal stomach with a 1 cm diameter anastomosis. The MG was chosen over Gastric Bypass for two groups of patients, 1, those that were morbidly obese but could not have a bypass for various reasons and 2, for those that needed lesser amounts of weight loss. The MG was chosen for 32 patients who had morbid obesity (MO) and an inability to perform a bypass and 207 patients underwent MG because of less severe obesity (LSO). Mean preoperative BMI in MO patients was 46.5 kg/m2, and mean Excess Body Weight (EBW) was 65 kg. The mean BMI in LSO patients was 34.6 and the mean EBW was 33 kg. There was no mortality. Major complications occurred in 2% of patients. There were few side effects. Mean weight loss was 31 kg (±10 kg), equivalent to 48% of excess weight in MO patients. Mean weight loss in LSO patients was 29 kg (±12 kg), equivalent to 87% of EBW. The results of the Mini-Gastroplasty are very similar to other restrictive operations (i.e. Lap Band, Sleeve Gastrectomy). When confined to lower weight patients it is a simple and successful procedure with a mean expected weight loss of 33kg equal to 87% of EBW. In heavier patients the absolute weight loss remains the same and the value of the procedure lessens although it can be useful in staged procedures and when a bypass cannot be performed. 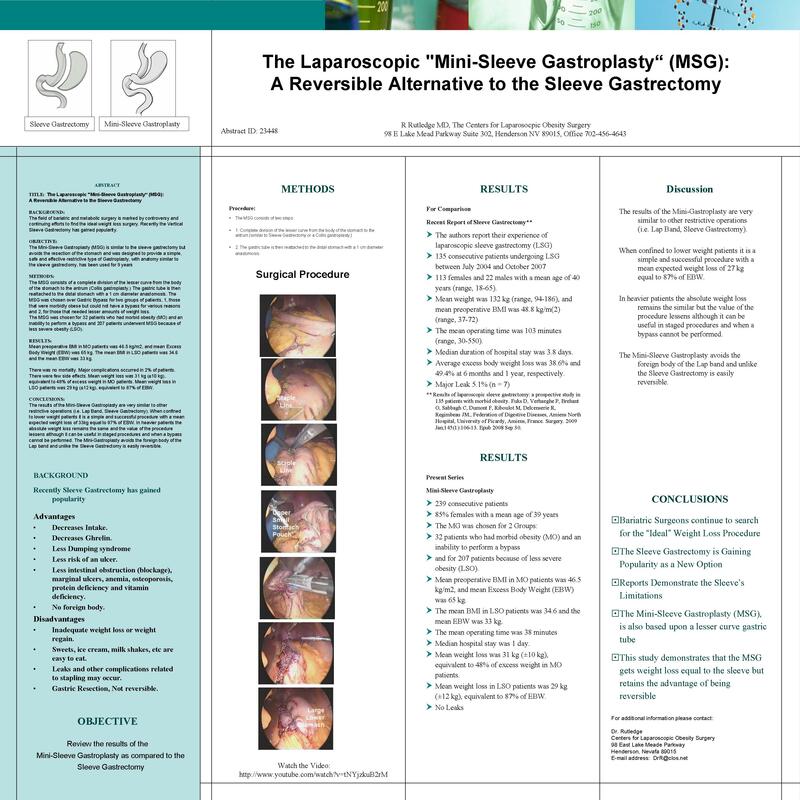 The Mini-Gastroplasty avoids the foreign body of the Lap band and unlike the Sleeve Gastrectomy is easily reversible.